Easy-care and easy to wear! Our Women’s Vansport™ Omega performance polo has been carefully designed to offer a comfortable and flattering fit throughout our entire size scale offering. Tuck it in, or wear it out – it’s ladies choice on this one. 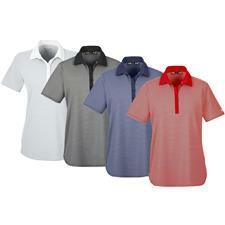 You are about to post a review for Logo Vansport Omega Solid Mesh Polo for Women based on your knowledge of its playability. This review will show up under all variations of Logo Vansport Omega Solid Mesh Polo for Women, including new, personalized, and custom logo.